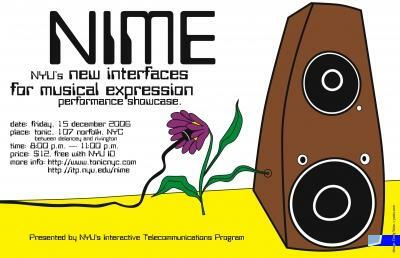 This Friday at 8:00 PM on Dec 15th 2006 the NIME show will be happening at New York City’s Tonnic club. For this annual event graduate students from NYU devise new interfaces with the goal of bringing “live” into electronic music performance as part of their homework. Damn, I want to take that class. Previous performances can be seen at NIME video archive on this flickr stream. Thanks to Jamie for sending this in.